The Dell PowerEdge C8220 compute node is designed for today's hyper-scale environments with on-demand capacity increases to processing power, memory, and storage. The Dell C8220 compute sled is a modular component of the C8000 chassis, which can support up to ten of these single-wide units. It can be added to a mix of other compute, storage, and graphics processing unit (GPU) sleds. This is a very flexible platform to help Administrators scale as needed with the addition of more nodes or chassis. This is a purpose-built server designed for web, hosting, data analytics, and cloud building. Each compute sled supports a maximum of two Intel Xeon E5-2600, or E5-2600 v2 processors with up to 12 cores each. Each processor controls 8 memory modules slots for up to 16 memory modules total in a two processor configuration. There are 16 memory slots on the compute sled chassis, with each processor supporting four channels with two memory slots each. With all 16 slots loaded with 32GB memory modules, the system will support up to 512GB of memory. Both registered DDR3 (RDIMM) and low voltage registered DDR3 DIMM modules are supported. With eight single-wide Dell C8220 compute sleds, the PowerEdge C8000 chassis will support up to 4TB of memory in a 4U space. A maximum of two 2.5-inch SATA or SATA II SSD or HDD drives are supported on the PowerEdge C8220 compute node for a maximum of 2TB using SATA II. The node also features an integrated C602 HD controller and several other internal and external HD/RAID controllers available depending on your application. An external RAID controller will connect to the C8000XD storage node, also housed in the C8000 chassis. 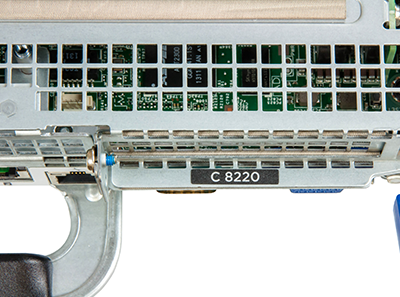 Dell's C8220 compute sled features a mezzanine expansion slot and a PCIe 3.0 expansion slot on the motherboard. There is also a MicroSD card reader slot located in the PCIe riser to support an embedded hypervisor. Ethernet connectivity is also handled by a dual GbE port with an adjacent dedicated 1 x 100MB management port. Aside from the base management controller (BMC) with Intel's Intelligent PowerNode Manager (IPMI) 2.0, management of this compute node is handled by other third-party solutions. No Dell OpenManage support is provided. The Dell PowerEdge C8220 compute node offers powerful performance in the PowerEdge C8000 chassis. This compute sled is an excellent platform for high-performance computing (HPC) and use in other mission-critical applications.